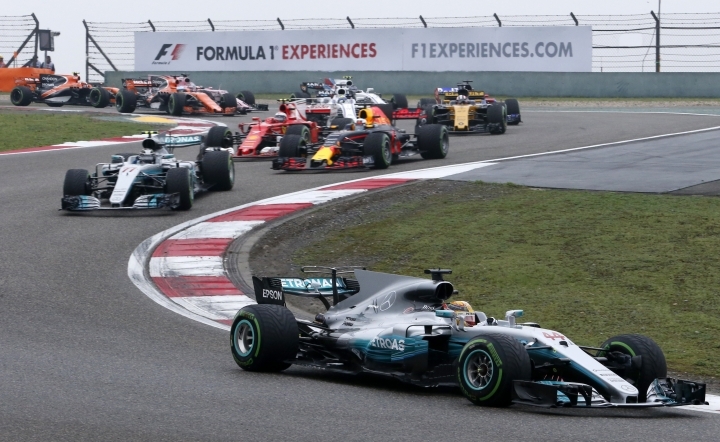 SHANGHAI — With Lewis Hamilton and Sebastian Vettel starting side-by-side on the front row at the Chinese Grand Prix on Sunday, the stage was set for a wheel-to-wheel duel between long-dominant Mercedes and a newly competitive Ferrari. 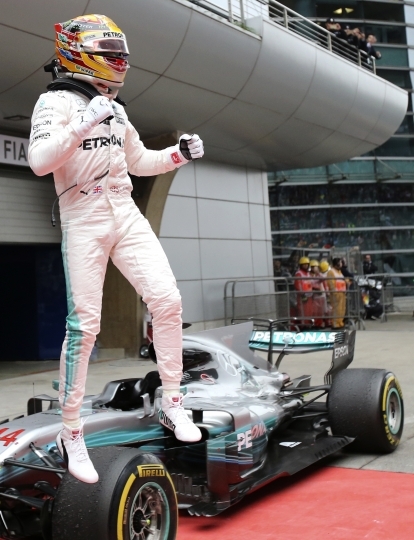 A chaotic start to the race on a wet track, however, scuttled the highly anticipated showdown as Hamilton coasted to victory for his fifth title in Shanghai and first of the new Formula One season. 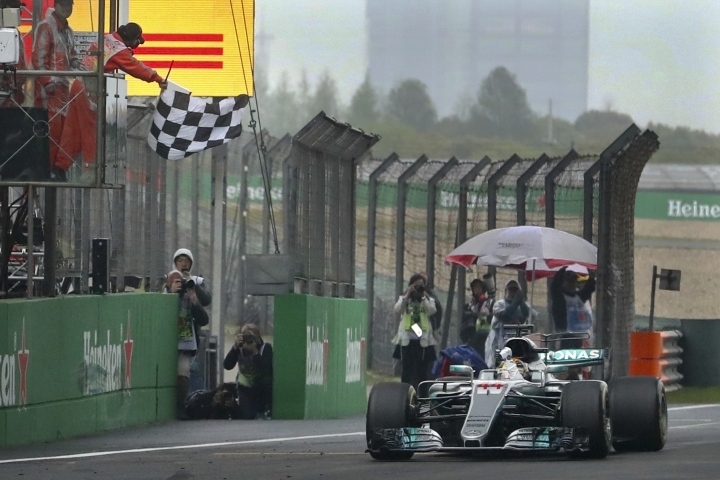 Starting from pole position, Hamilton led from beginning to end to capture the race in 1 hour, 37 minutes, 36.158 seconds and pull even with Vettel atop the driver's standings with 43 points. Two weeks after beating Hamilton at the season-opening Australian GP, Vettel had to settle for second place this time, finishing 6.2 seconds behind his rival. With both teams showing equal pace at the top, there will likely be plenty of other opportunities for close races this season. "I'm fighting up against a four-time world champion (and) he is at his best and he is phenomenally quick. And Ferrari are at their best in years," Hamilton said. "And we're at our best as a team and I feel like I'm at my best." "The ultimate fighter always wants to go up against the best battle you can have. Because then when you come out on top, it's so much more satisfying." Red Bull's Max Verstappen drove a masterful race through traffic to move up from 16th position on the starting grid to third place, fighting off a spirited challenge from teammate Daniel Ricciardo on the final lap. Ricciardo finished fourth, followed by Ferrari's Kimi Raikkonen and Mercedes' Valtteri Bottas in sixth. The drama-filled start after a rainy morning set the stage for Hamilton's victory and Mercedes' recovery after Vettel surprisingly triumphed in Australia and signaled that Ferrari had the pace this year to challenge the silver cars. The drivers had barely left the starting grid when Williams' Lance Stroll bumped against Sergio Perez of Force India and spun off the track into a bed of gravel. 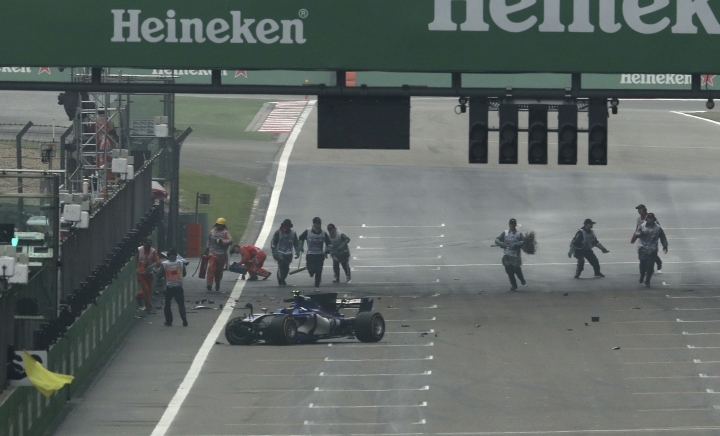 A short time later, on the fourth lap, Antonio Giovinazzi hit a wet patch and slammed into the wall, severely damaging his Sauber car and bringing the race to a halt again. During the safety-car slowdowns to remove both cars from the track, the top drivers pitted to change to softer tires, reshuffling the starting order. Hamilton emerged from the fray with a hold on the lead, but Vettel and Bottas slipped back several places and had to fight to catch up. After Vettel's victory on the Albert Park street circuit in Melbourne, Ferrari showed it can also match Mercedes' pace on a traditional track with long straights following the off-season F1 rule changes that ushered in faster cars with wider tires, better aerodynamics, bigger fuel loads and increased downforce. The goal was to increase the competition at the front of the grid — and two races into the season, the changes have certainly had an impact. "If we can challenge Mercedes again (going forward), that's very good news," Vettel said. "They've had a very, very strong run the last couple of years. This year, as well. If we can be close, that's good." Verstappen, meanwhile, made clear that Red Bull isn't that far behind. 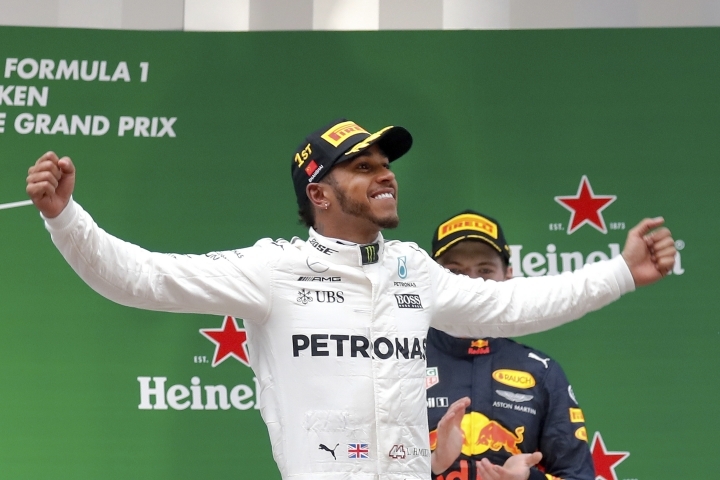 The young Dutch driver passed nine cars on the opening lap and was even threatening Hamilton at one point, but fell back and eventually lost second place to Vettel. "I had a good start and I got a bit of luck," he said. "Nine cars is quite a lot in one lap, but of course very happy that it worked." 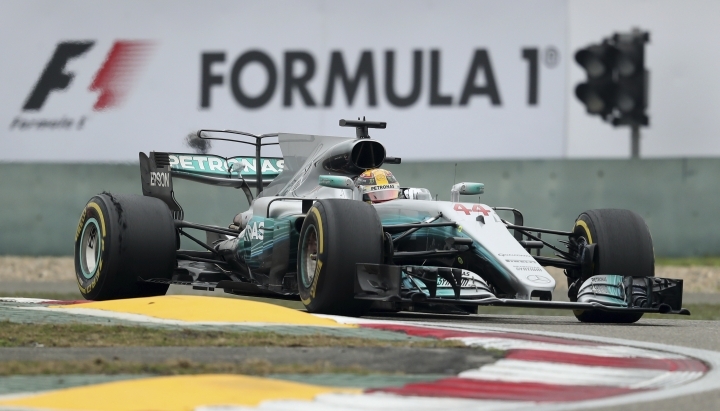 The first half of the race brought plenty of daring passes as the Ferrari and Red Bull cars jockeyed for position behind Hamilton. 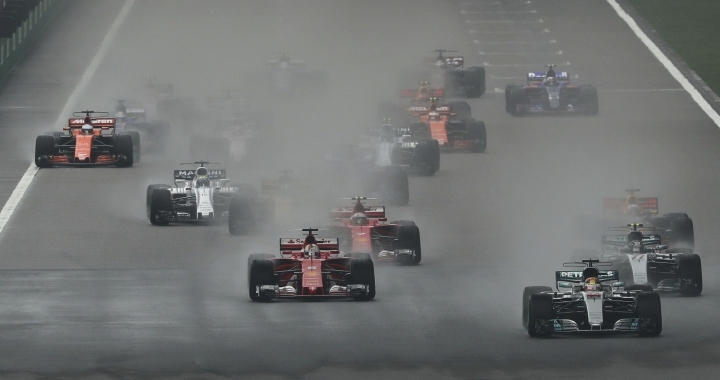 Vettel made two brilliant passes of the Red Bull cars — bumping wheels slightly with Ricciardo — but couldn't close the gap with Hamilton in the end. 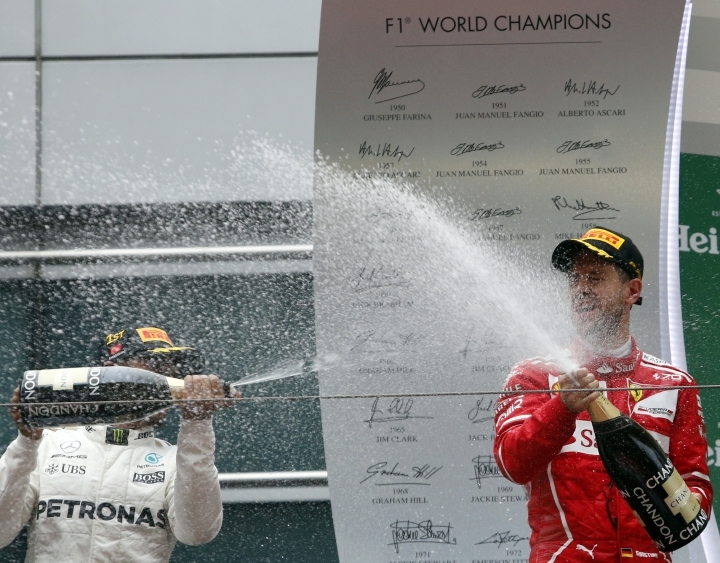 "Obviously, we were a little unfortunate with the safety car early on," Vettel said. "But even if it wasn't there, you never know how it could have impacted on the race." Also earning points were Carlos Sainz of Toro Rosso in seventh, Kevin Magnussen of Haas in eighth, and the two Force India cars, Sergio Perez and Esteban Ocon, in ninth and 10th. A number of drivers failed to finish. Stroll and Giovinazzi never returned after their early mishaps, and they were joined on the sidelines by McLaren's Stoffel Vandoorne and Toro Rosso's Daniil Kvyat, who retired with mechanical problems. McLaren's other driver, Fernando Alonso, was also forced to stop on lap 34 with a driveshaft problem. The veteran Spanish driver had been running eighth at the time, a strong performance given McLaren's considerable technical issues in preseason testing.